You are worried about the driver license test? Stop worrying and start studying with our FREE DMV permit practice test! You'll be surprised how close the app is to the real thing! WHY CHOOSE DMV PERMIT PRACTICE TEST - Practicality: Our test offers 350 of the most common multiple-choice questions based on the official DMV’s driver’s manual for your state so you might want to keep that within arm’s reach for reference. Both road signs and road rules are covered. It will help you prepare for the DMV Permit Test and Driver’s License Exam. - Detailed explanations: if you choose the wrong answer, we’ll not only display the correct one, but also show you an explanation – so that next time you don’t make the same mistake again! - State-specific: unique questions for every U.S. state which based on the specialized knowledge in each state's DMV manual. 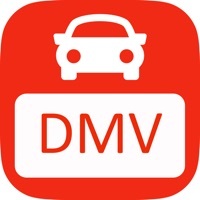 You can refer this app for any of the 50 US states you are appearing for the DMV Permit test. Alabama (AL), Alaska (AK), Arizona (AZ), Arkansas (AR), California (CA), Colorado (CO), Connecticut (CT), Delaware (DE), Florida (FL), Georgia (GA), Hawaii (HI), Idaho (ID), Illinois (IL), Indiana (IN), Iowa (IA), Kansas (KS), Kentucky (KY), Louisiana (LA), Maine (ME), Maryland (MD), Massachusetts (MA), Michigan (MI), Minnesota (MN), Mississippi (MS), Missouri (MO), Montana (MT), Nebraska (NE), Nevada (NV), New Hampshire (NH), New Jersey (NJ), New Mexico (NM), New York (NY), North Carolina (NC), North Dakota (ND), Ohio (OH), Oklahoma (OK), Oregon (OR), Pennsylvania (PA), Rhode Island (RI), South Carolina (SC), South Dakota (SD), Tennessee (TN), Texas (TX), Utah (UT), Vermont (VT), Virginia (VA), Washington (WA), West Virginia (WV), Wisconsin (WI), Wyoming (WY). DISCLAIMER: This app is for general information purposes only. This app is not intended to be relied upon in any dispute, claim, action, proceeding or for legal advice. For official law descriptions and administrative centers, please consult the respective state body. This app made it very easy to learn and to have comprehension questions after reading the book. Thank you , you made it possible to pass my permit test today! This app is awesome!!! It has questions that I can relate to and it has the right amount of info I need to know. 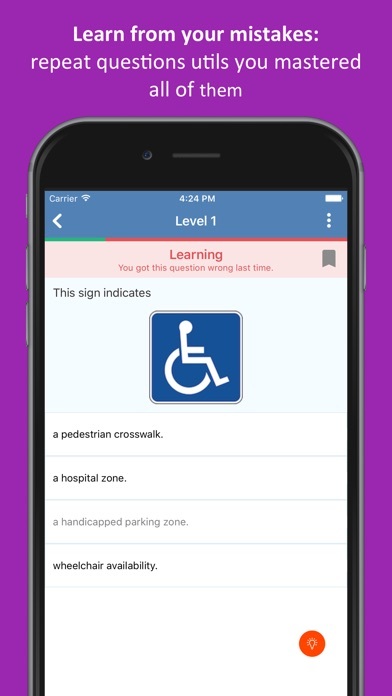 This app is a great app , I used this app to practice for my permit test ! I passed using this ! 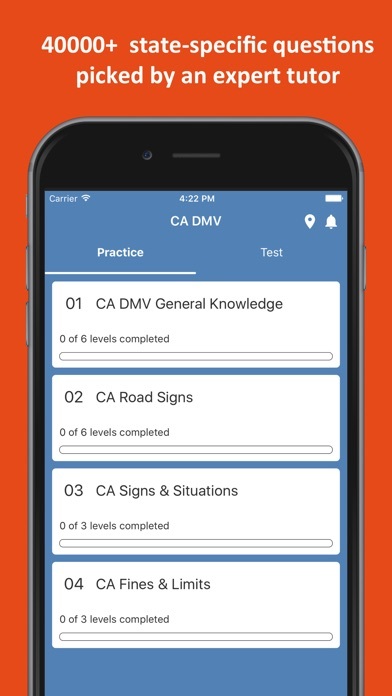 Best app to prepare for the DMV test! This is an awesome app but it keeps crashing when I take the practice tests. Please fix I gotta know how to do this before hand. This app is a lifesaver! I looked at the drivers guide book about once and downloaded this app the day before I took the test. I went through every level and then passed my test at 90%. Highly recommend. I got this up because I needed to renew my license. What I like about this app is that it repeats the questions that I got wrong so I can practice those again, and it doesn't have random pop up adds in the middle of the test (only after). I’m hoping this helps me for when I take my test next week. This helped me pass ! I downloaded this on a Wednesday & I studied it & practiced ! Took my test on a Friday the same week & I passed !!!! This really HELPED ! Has a lot of good reviews on information and is well organized. How can I get a refund for the $3.99? Can I get it back? Thanks so much for this app I passed my permit the first try. Great way to learn easily. 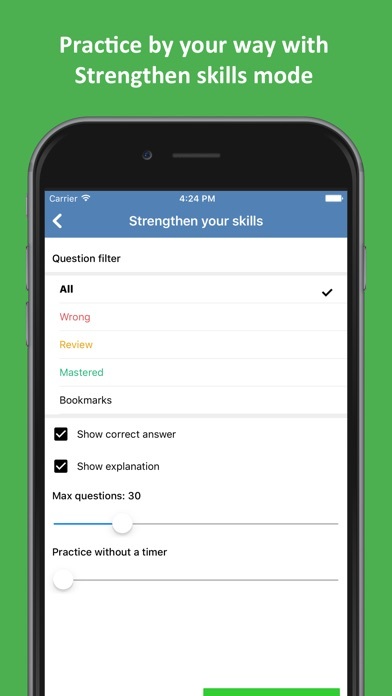 This app lets you know immediately when you get a question wrong and shows you the right answer when practicing, instead of waiting until the end of the lesson to show you which ones you got wrong. It then goes over the ones you got wrong to make sure you memorize them. This is helping me to learn the answers so much faster. I really enjoy practicing on this app! I like how we have up to 29 questions to answer and then the questions we get wrong we re- do them and then they randomly pick questions we got right to refresh our memory. I feel very confident with this app!! 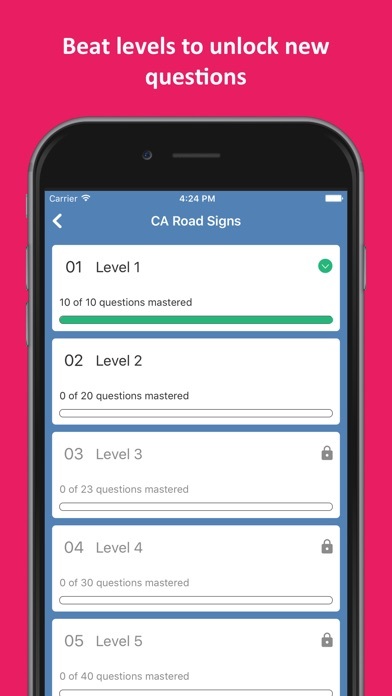 I’ve been looking for an app that gives you questions close to the actual test! This app gives you the most actual and realistic questions you can get to. After you restart every test it gives you new questions. So you don’t have to just keep studying the same ones! I’m going to take my permit test tomorrow so wish me luck!!! But in my opinion this is the best app i have seen for studying to get your permit . Good Luck! This app is helping me study I’ll let you know if ur helps me pass the test. The best way to learn all the questions.. 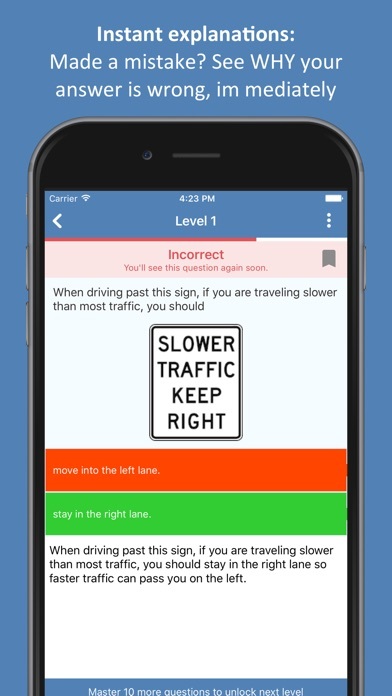 This app is a great way to learn the rules of driving. It helps people who have a hard time comprehending so basically it dumb it down. I live in Miami and 89% of what’s on here I saw on the DMV exam. I pass with a 93%, thank you for making it free too. It’s the best app that I had to practice for my life. I like it so far thank you. I failed my exam & I studied this app about 2 hours everyday for a week & I failed...there were some questions that weren’t in the app but in the test there was..